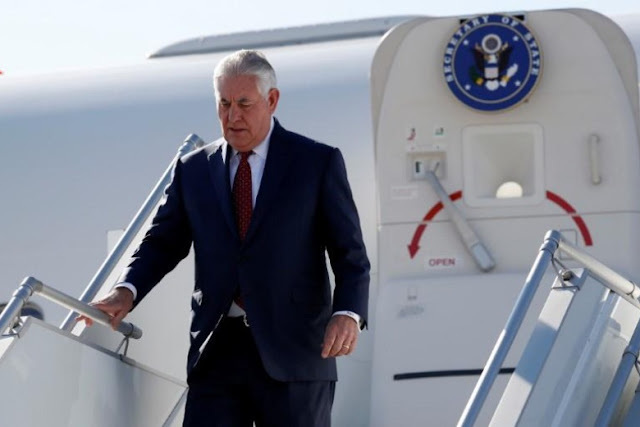 U.S. Secretary of State Rex Tillerson steps off his plane as he arrives in Geneva, Switzerland October 26, 2017. GENEVA - President Bashar al-Assad and his family have no role in the future Syria, U.S. Secretary of State Rex Tillerson said on Thursday. Tillerson said the only reason Assad’s forces had succeeded in turning the tide in the more than six-year war was “air support they have received from Russia”. Iran, the other main ally of Damascus, should not be given credit for the defeat of Islamic State, as it was a “hanger-on”, he said.